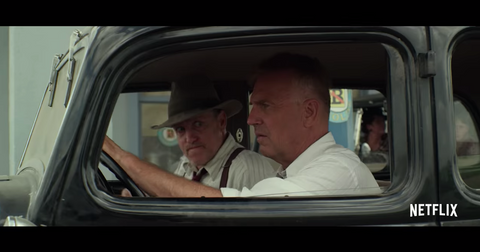 Whether or not you've tuned into Netflix's newest feature film, The Highwaymen, it's one you'll definitely want to add to your queue. It tells a story you've heard before, the one of criminals Bonnie and Clyde who robbed and killed 13 people before being gunned down by state police. Except, The Highwaymen flips the lens on the story we're familiar with, and rather than glorify the criminal couple, tells it instead from the perspective of the retired Texas Rangers who are tasked with putting an end to the notorious couple's spree. And the Rangers, Frank Hamer and Maney Gault, who were charged with taking down the most famous criminal duo in history, are played by the inimitable Kevin Costner and Woody Harrelson. The chase drama was actually supposed to be made in 2003, when screenwriter John Fusco was hoping that Robert Redford and Paul Newman would take on the roles. But since life, death, and cancer got in the way of making the initial film happen, viewers got Kevin and Woody to bring the Rangers to life, and these stars were so devoted to their roles, we're honestly blessed the change in casting happened. 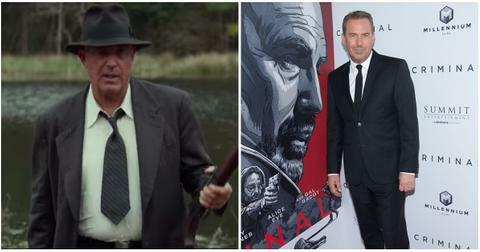 So, did Kevin Costner gain weight for The Highwaymen? Viewers of The Highwaymen will definitely realize that Kevin looks practically unrecognizable in the film. And the reason for that is that he had to put on a bit of weight to play a convincing Frank Hamer in the film. "I saw it about 10 years ago, and I thought it was good then. But it didn't fit what I was doing or thinking about [at the time]," Kevin revealed in a Vanity Fair interview about his initial decision to pass on the 2003 project. But flash forward 15 years, and Kevin was ready to do whatever it took to tackle this role. "I knew to play him, I would have to put on 10, 12 pounds, and not be able to get over a fence," he said. Kevin even managed to stay in character when his co-star Woody Harrelson, who Kevin describes as being "pretty big on health," tried to get him to stray from his weight-gaining diet. "[Woody]'d always have a big jar of something green to drink," Kevin said in a recent interview with Entertainment Weekly. "And he was always very quick to offer it to me. I would shake my head like a kid who didn't want to eat any more vegetables." That's because when Kevin is working on a new film, nothing is more important to him than truly embodying the character he's playing. "I'm willing to play it and when I do, I try to go after it as deeply as I can," he went on to say. "I'll put weight on and chop my hair, slow down. If I feel like I understand a character and I feel like I can inhabit it, I feel like it's the right time, then I will take it on." Kevin isn't the only cast member of The Highwaymen to transform for the film. 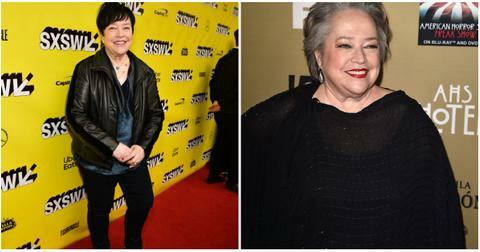 Although Kevin and Woody are the title characters who undoubtedly carry out the majority of the film's action, Kathy Bates also stars in The Highwaymen as Miriam "Ma" Ferguson, the first female governor of Texas who was eager to put an end to Bonnie and Clyde's robbery and murder spree. 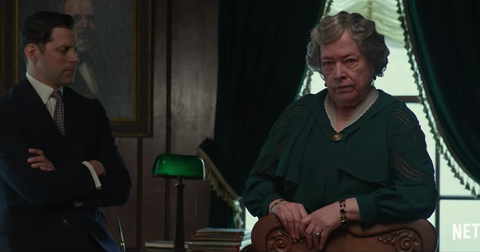 And we honestly had to make sure it was really Kathy herself when we first saw the movie's trailer. At 70 and with myriad roles and awards under her belt, Kathy's look is pretty much iconic. But when she showed up to the premiere of The Highwaymen, she had lost over 60 pounds. "My niece told me this little secret — I guess it's no secret — it's a biological thing," Kathy said to Daily Mail about how she achieved the dramatic results so quickly. "At some point when you're eating, you have this involuntary sigh and that's really your brain and your stomach communicating that you've had enough." "The trick is to pay attention to that and push your plate away," the actress continued. "It took a few years. I would say you have to be really patient... I don't like the word willpower, but I like the word determination." Don't miss the chance to see these incredible actors' transformations for yourself. 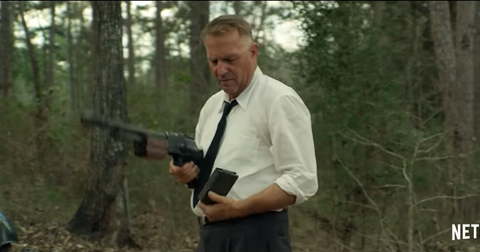 The Highwaymen is now streaming on Netflix.